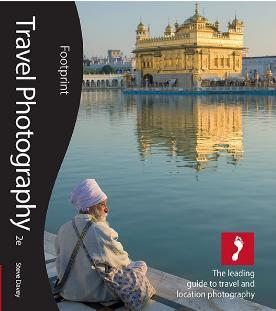 Footprint Travel Photography is all that you will ever need to improve your travel photography. It takes you from the vital preparation and selecting of equipment before you go, to the ins and outs of being on the road. It exhaustively covers the technical and practical aspects of travel photography before looking at how to tweak and improve your pictures on a computer. There is even a section for those who would like to make some money out of their hobby. Travel photography is about more that just technicalities: a travel photographer has to work in many styles and this guide has an extensive inspiration section, giving hints and tips for different picture taking scenarios you will encounter. With Footprint Travel Photography, you don’t just get a book: you get access to a dedicated website that will have further information, more in depth professional tips and extra image galleries. Uniquely, the website gives you the opportunity to ask questions direct to the author and even submit your own pictures for comment and criticism. If you are interested in Steve's new range of photo tours to the fascinating and exotic countries of Jordan or Uzbekistan, and the incredible Arctic region of Svalbard, either use the 'Tours' link above, or click here to be taken direct to the dedicated tours website.